With planners and allied professionals from around the country and abroad attending the 2019 National Planning Conference, an impressive amount of experience and knowledge will assemble in San Francisco. One way APA attempts to focus some of that highly concentrated planning knowledge each year is through the AICP Community Planning Workshop. For 20 years now, APA has worked with local planners in each NPC host city to organize this outward-focused event. The workshop gives a group of attendees the chance to roll up their sleeves with local community members and focus in on one of their pressing planning challenges. It’s a unique opportunity to aid a local community, learn from their experience, and leave a positive impact. The 2019 AICP Community Planning Workshop will focus on an area of downtown Oakland that includes the city's historic Chinatown. Photo by Daniel Olsen. This year, the workshop will be held on Saturday, April 13, in downtown Oakland in the area surrounding the Lake Merritt BART station. This area is in the heart of Oakland Chinatown, the only historic urban Chinatown surviving in California outside of San Francisco. Attendees from around the country will meet and engage with community. Discussions will center on the successes and failures of community benefit districts. Areas of focus will include financing tools and mechanisms, cultural districts, parking assessment districts, and business improvement districts. Oakland, like much of the Bay Area, is experiencing rapid growth and change. Staying ahead of that change is a challenge. And staying engaged with the community to create a path forward to define, refine, and bring its shared vision to life is critical. Community stakeholders aim to protect the area’s status as a thriving, inclusive cultural district, while also building ownership and wealth in the community, and minimizing the displacement that too often comes with the intensity of growth and development they are witnessing. Established since the mid-1800s, Oakland Chinatown has a significant history of disruption and displacement. Much of it occurred in the era of urban renewal during the mid-20th century, which wreaked havoc on many marginalized communities. Construction of the I-880 freeway in the 1950s claimed part of the community, including the Buddhist Church of Oakland. Many residences were also removed in the 1960s for the construction of the Lake Merritt station. Land was also cleared in the area for World War II wartime housing. 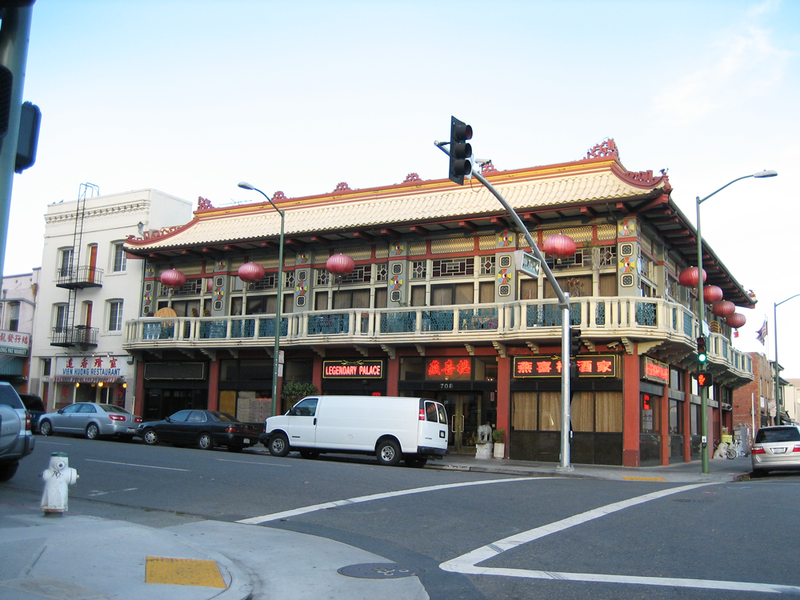 Oakland Chinatown is a unique historic area that supports a diverse population and culture. Image from Lake Merritt Station Area Plan (December 2014). The community is committed to protecting the area’s important cultural resources and maintaining the diversity that helps define its unique identity. The city of Oakland, in collaboration with BART, Peralta Community College District, and a cross-spectrum of community stakeholders, worked together from 2010 to 2014 to develop a specific plan, the Lake Merritt Station Area Plan. This vision sets forth a 25-year roadmap to add 4,900 new housing units, 4,100 new jobs, 404,000 square feet of additional retail, and 1,229,000 square feet of office space. The Lake Merritt Station Area Plan seeks ways to create new and enhance existing open space and recreation areas. Image from Lake Merritt Station Area Plan (December 2014). The amount of development over just the last five years in the area is striking: 1,300 units are currently under construction. 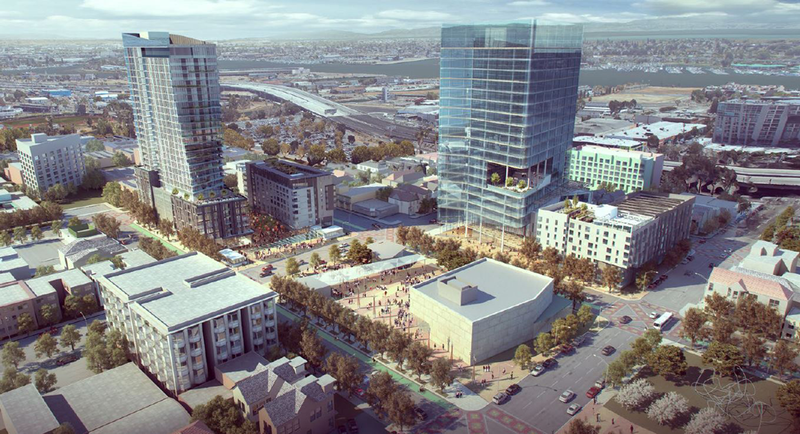 And in September 2018, BART approved the master developer for a new development overtop the Lake Merritt station. The conceptual draft plan includes 519 residential rental units with 226 of those dedicated below-market affordable residents; 517,100 square feet of office space with 92,100 square feet dedicated below-market users; and 27,400 square feet of ground-floor commercial space dedicated to small business incubation and community-serving uses. In September 2018, the BART Board approved a master developer that submitted this conceptual design for the site over the Lake Merritt station. Image from EBALDC and Strata Proposal for the Redevelopment of Lake Merritt BART Station. Achieving the community’s vision will require new tools and approaches. Local leaders recognize a need to establish more sustainable funding mechanisms beyond one-time development-related impact fees. Get more details about the community in the 2019 AICP Community Planning Workshop Briefing Booklet. Apart from the annual workshop at NPC, APA works with communities throughout the year through the Community Planning Assistance Teams (CPAT) program. Teams of volunteer planning professionals spend a week engaged with stakeholders working to address planning and design challenges in communities around the country. At NPC19, check out the CPAT satellite exhibit sponsored by WRT on the second floor of the Moscone Convention Center to learn more about the program and find out how to get involved. An interactive exercise will give people the chance to mark where CPAT should go next, and what issues to tackle. The flip side of the space will allow for conference participants to share their thoughts on the challenges our cities and towns face today. WRT and APA see this as a way to stimulate conversation and to encourage attendees’ input on themes of resilience and other planning topics they’re learning and sharing about during NPC19. The Bay Area’s complex geography, mapped with a focus on resilience, provides a backdrop for this conversation. If you haven’t yet registered for NPC19, it’s not too late! Register today to attend this year’s National Planning Conference, where you can learn from leading planners about new trends and challenges that are motivating colleagues worldwide to plan smarter. Top image: Oakland Chinatown street crossing. Image courtesy Visit Oakland. Ryan Scherzinger is APA's professional practice programs manager.